FLORHAM PARK, N.J. (AP) — Flashes of brilliance. Spurts of inconsistency. Steady progress. The first eight games of Sam Darnold’s NFL career have been marked by the ups and downs typical of a rookie quarterback playing his way through a crash course of a life as a pro. Starting now, though, the face of the New York Jets franchise wants more. Darnold is tied with Denver’s Case Keenum and Tampa Bay’s Jameis Winston for the most interceptions in the NFL with 10. A week after throwing three against Minnesota, the No. 3 overall pick had none in New York’s loss at Chicago. That’s progress, and something off which he can build. 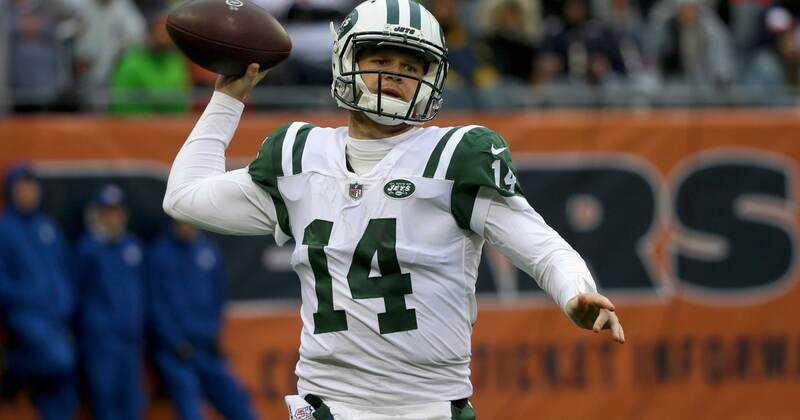 As far as the Jets are concerned, Darnold is better than just “all right.” They like the way he has handled himself during both the highs — a two-game winning streak during which he threw five touchdown passes — and the lows — a three-game skid and the team’s current two-game losing streak. From the time Darnold was declared the starter for the season ahead of veterans Josh McCown and the since-traded Teddy Bridgewater, it has been all about letting him learn and grow. “Just being able to find consistency,” Darnold said when asked what his biggest focus has been. “I think I’ve done a pretty good job of, first of all, finding the open guys, but also I think I can do a better job of, once the open guy is not there if the first and second guy is not there, know exactly where my check-down is and go to him. If he’s not there, go right to a scramble drill or look to find open room. Darnold is 21, but his approach is that of a more-seasoned player who has been through it all before. It has served him well, as has his refusal to repeat mistakes on the field. Darnold has 11 touchdown tosses, having thrown at least one in each game except for the distressing loss at Cleveland in Week 3. There are other numbers, though, that look very much like they belong to a rookie. His 55.2 completion percentage — 138 of 250 passing — is the second lowest in the league among quarterbacks who have thrown at least 130 passes. Darnold’s 74.5 quarterback rating also ranks among the NFL’s worst. The Jets rank 29th in overall offense, including 28th in the passing game. They’re also 28th in the league while averaging 200.4 total yards per game, and their 314.1 yards per game is better than just three teams: Tennessee, Buffalo and Arizona. The last two also have been led by rookie QBs. The Jets’ struggles aren’t all on the rookie. Ankle injuries to Quincy Enunwa and Robby Anderson have left Darnold without his top two receivers, and there have been few options to step up in their place. Running back Bilal Powell, a versatile threat out of the backfield, is out for the rest of the season with a neck injury. Darnold will get a chance to start turning things around on the field and in the standings Sunday at Miami, the first opponent he’ll face for a second time. In Week 2, he had a season-best 334 yards passing, but also had two INTs in a 20-12 loss at home. He knows none of this is easy, and didn’t expect it to be. Darnold just wants to be better. NOTES: WRs Quincy Enunwa (sprained ankle) and Robby Anderson (ankle), TE Neal Sterling (concussion), NT Steve McLendon (ankle), CBs Trumaine Johnson (quadriceps) and Morris Claiborne (excused absence), and LBs Frankie Luvu (neck) and Kevin Pierre-Louis (foot) did not practice. … C Spencer Long (knee/finger), S Marcus Maye (thumb), LT Kelvin Beachum (knee/ankle) and LB Jordan Jenkins (ankle) were limited.